I have been teaching lace dying for over ten years now. I use the word “teaching” lightly because there is just nothing to this. Here are a few tips and hints about how to go about this. You just can’t get better than that! Some pretty rayon laces. The size and shape is up to you. Dropper Caps to fit the bottles. Your special brush to apply the dye with. One plastic bag to lay your laces on. A fine mist spritzing bottle. Some garments to apply the lace to. Switch each bottle cap with a dropper, then shake the bottles well. Place the bottle caps in a plastic lid to prevent them spilling. Put a few drops of each color in a small dish, a divided Styrofoam plate and add water. This dye is very strong so you don’t need much. About 1 drop dye to 10 drops of water. I found it easiest to dampen the whole piece of lace and then roll the excess water out with a towel. Lay out the plastic bag and get comfortable. Dampen the lace in the sink if it is heavy, thick lace or if it’s a lighter lace, you can lay it out on the bag and spritz it with the mister bottle, a little at a time. Fill your spritz bottle so that when the lace begins to dry, you can give it a little mist. 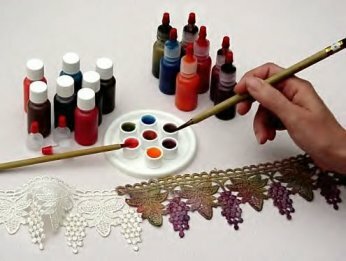 Put a small amount of dye on the lace, using your paintbrush. Don’t worry about washing out your brush each time when you change colors, the dye will all bleed together anyway. Practice with your colors on a couple of end pieces of lace. Not happy with what you have done? Just blot out the dye and put another color on. The more water you put on, the more the colors will bleed together and the less potent the colors will be. Less water, stronger colors...more water, the lighter they will be. When you’re finished painting, let your laces air dry. Then iron them from the wrong side for about 2 minutes. This helps to set the color and makes the laces much softer. When you are ready to wash the garment you have embellished...just treat it however you would something nice. Warm to cool water and medium or permanent press dryer. This is truly the easiest thing I have ever taught. There isn’t any way that you can mess this up! And, you have a 100% chance of enjoying yourself and making something beautiful!